In this book I examine three eschatologies that until now have not been put together in any kind of systematic comparative perspective: the rebirth doctrines of small-scale societies in various parts of the world, such as West Africa, Melanesia, the Northwest Coast Amerindians, and the Inuit (Eskimo); those in the Buddhist, Jaina, and other religions that flowered in the Ganges valley around the sixth century b.c.e. ; and those of the Greeks of the Pythagorean tradition of roughly the same period, which culminated in the soteriological and cosmological thought of Plato and of Plotinus in later times. I maintain that this material can be read at several levels. The comparative perspective can apply to each of three broad substantive domains that I deal with here. The rebirth theories of small-scale societies discussed in chapter 2 have structural similarities that derive to a considerable extent from their smallness. Take two ideas common to virtually all of these societies: first, a dead person will circle back to the same kin group; and second, a neonate can be identified as a specific ancestor returned. I show that although the first feature is applicable to every small-scale society in my sample, the second feature is absent among one of them, the Trobrianders. I demonstrate in my analysis that among Trobrianders it is meaningless to so identify the neonate, given this society's notion of ancestors as mostly anonymous beings. It would be logically and structurally impossible for Trobrianders to get interested in the issue of the identity of the neonate. I also show that among the small-scale societies mentioned in this work there is a fundamental difference between the Amerindians and the rest, that is, West Africans and Melanesians: the presence of animal rebirth in the former and its absence in the latter. The presence of animal rebirths in Amerindian-Inuit societies permits us to establish an important link, methodologically speaking, with both the Buddhist and Greek worlds, which share that same propensity; and it helps us isolate Amerindian and Inuit forms of rebirth in our sample of preliterate societies as the ones most significant for comparative purposes. As in the small-scale societies mentioned above, Buddhist and Greek doctrines of rebirth also permit internal comparisons such that the Indic religions exhibit close similarities and differences, as do the Greek ones. However, the main point of this work is not to demonstrate internal similarity and difference but to examine structural similarities and variations across the great cultural divides that separate Amerindian, Buddhist, and Greek rebirth doctrines. This may seem a hopeless task at first glance because anyone knows that on the substantive level the actual ethnographic or historical accounts of rebirth theories are vastly different, and there is little to connect Buddhist, Greek, and Amerindian rebirth. Yet this work will show that underlying these vast differences are important structural similarities and variations based on a shared belief in reincarnation, which I show has an unvarying "elementary structure." Hence the methodological thrust of this book: I can demonstrate how transformations can occur on the basis of this common elementary structure, which permits me to depict and compare limited "topographical models" of rebirth theories across great cultural divides. But the structural models are not anchored to universalist theorizing as in Lévi-Strauss's structuralism; rather they have been constructed in the manner of "ideal types" geared to my specific research interest. Thus, this book is an attempt to demonstrate that, although one must eschew universalistic lawlike theories modeled on the natural sciences, one must also reject the contemporary fascination in my own discipline for ethnographic particularity and a rejection of theory unless it shows that no theories are possible outside descriptive specificity. In this work I make the claim, and demonstrate as best I can, that limited comparison and theorizing are possible in the human sciences. The topographical models I have constructed simplify the complexity of eschatologies on the ground, as it were, permitting us to focus primarily on specific issues of structural similarity and transformation rather than on substantive content. Still, any idea of structure is senseless without the substantive content that permits the construction of simplified models. Once the models are constructed, one can infer some "expectable" features of content in the empirical record. For example, I show that from a structural point of view one could expect societies with rebirth doctrines to show a preoccupation with "endoanthropophagy" (endocannibalism). In reality some do, and some don't; but once one isolates the structural problem of endoanthropophagy, it is possible to adduce reasons for the absence of this phenomenon in specific cases, such as in Buddhism, or, failing that, to at least describe the absence in a specific cultural context. In other instances even these operations may not be possible because of the paucity of relevant sociological and historical data. The preceding remarks may suggest that I have ventured into abstract realms of little concern to Indologists and classical scholars. Although I primarily address anthropologists, historians of religion, and other inquisitive intellectuals, I try to present my argument in a fashion intelligible to those outside the human sciences. Moreover, readers who are put off by abstractions and who are unsympathetic to my theory of ethical and structural transformation might find provocative my descriptions and incomplete interpretations of specific rebirth eschatologies and cosmologies from different regions of the world. The comparative information might also surprise many scholars and lay readers who have been prejudiced into thinking that such doctrines are the exclusive preserve of the religions of India. My initial rationale for embarking on this project was to justify decentering India as the home and ground of rebirth. 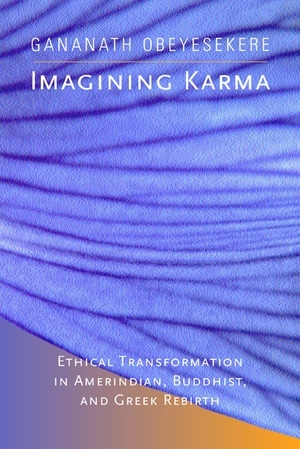 But I go beyond my Buddhist prejudice to a vision of a larger purpose: I explore the common fate of those societies that through historical accident or through the circulation of ideas or through independent invention have come to believe in reincarnation as an integral part of their larger eschatological and cosmological belief systems. In the more abstract arguments presented in this work I explore the implications of that common fate. Another, related, major theme pertains to general epistemology, namely, how thought is constrained within the frame of preexisting knowledge structures—what Foucault called "epistemes"—and the freedom and leeway for innovation and debate permitted to the individual virtuoso or layperson. This book had a very modest beginning. The problem of the ethical transformation of a previously "amoral" eschatology into a more complex karmic doctrine was one of my early intellectual concerns, but at that time I framed my concern in terms of the origin of the karma theory. I first presented these ideas in Edmund Leach's seminar at King's College, Cambridge, in 1964 and subsequently published them in "Theodicy, Sin, and Salvation in a Sociology of Buddhism. "1 In this first paper I had little information on rebirth theories outside of the Indic area, but I soon discovered the Trobriand eschatology. In 1971, at the 28th International Congress of Orientalists in Canberra, I presented a paper with the deliberately facetious title "Why Is There No Buddhism in the Trobriand Islands?" (which even I did not have the temerity to publish!). In 1980 I followed this paper with "The Rebirth Eschatology and Its Transformations: A Contribution to the Sociology of Early Buddhism," an essay that brought in data from Igbo, Trobriand, and Pythagorean and Orphic religions.2 However, fascinating and crucial data from the Northwest Coast Indians and the Inuit were absent. Until I read papers by Antonia Mills, I was ignorant, like many others, that Amerindians possessed theories of reincarnation. I participated in a seminar organized by Mills and wrote a foreword for her collection of seminar papers, subsequently published under the title Amerindian Rebirth: Reincarnation Belief among North American Indians and Inuit. In that foreword I relate Amerindian rebirth theories to those theories found on the Indian subcontinent.3 Amerindian rebirth provoked me to rethink the problem of karma, not so much in terms of its origins but in relation to structural and ethical transformations. Nevertheless my early bias toward Buddhism is reflected in the present work. Some of my most important theoretical findings—including the central concept of "ethicization"—are a product of my engagement with early Buddhism. Yet my engagement with rebirth eschatologies of small-scale societies has in turn affected my understanding of both Buddhist and Greek rebirth doctrines. I was able to rethink these early interests during my sabbatical in Sri Lanka as a Fulbright scholar during the 1993-94 academic year. As always, Sri Lanka, in spite of the violence in which it was enmeshed, inspired my creativity, and during the course of that year I wrote a preliminary draft of this book, focusing on the Amerindian and Indian material but excluding the Greek. The reason was simple: I found my foray into the Greek world in my 1980 paper shallow and unsatisfactory. I therefore decided, somewhat reluctantly, to ignore it. My sabbatical culminated in a marvelous stay at the Rockefeller Center in Bellagio, where I had hoped to put the finishing touches to the book. During my leisure hours at Bellagio I began to reread Plato and whatever was available on the Presocratics at the Bellagio library. I soon recognized that I had no choice but to use the Greek material because, like the Indic and the Amerindian, it included the notion of animal rebirths, a notion crucial to my comparative perspective. Thus the Greeks came to stay in my book. The Presocratic Greek material was especially difficult for me owing to its fragmentary nature, and this difficulty was compounded by the fact that classical scholars sometimes address their own circles with little serious comparative or theoretical thinking. The task was rendered even more difficult because two writers, H.S. Long and M. Peris, who dealt with this topic explicitly, did not always render the Greek into English.4 Fortunately, I soon invented my own rationale for bringing in the Greek material, and it can be briefly stated as follows: Contemporary scholars and intellectuals in the West quite rightly see the Greeks as the fountainhead of Western culture, and this view has resulted in a special take toward ancient Greece, one, for example, that highlights Greek rationality and its "enlightened" thought. In this scheme Plato is a key figure, the epitome of the Western speculative philosopher, whose thinking has come down through the Neoplatonists into later Christian theology. Yet Europe as we now understand it scarcely existed in Plato's time or in the time of the Pythagoreans that are the foci of my study. Although European thinkers see the Greeks as their intellectual forebears, the Greeks themselves looked toward the East for the sources of true wisdom—to Egypt, Persia, and, during the early centuries of the common era, India. Thus tradition has it that early Greek thinkers traveled East in their quest for knowledge. Pythagoras, for example, is said to have wandered into Egypt and later to have sat at the feet of Zoroaster. These traditions might not be based on fact, but they do illustrate the reality that Greeks saw the East as the source of knowledge, in much the same way that modern Europeans relate to the ancient Greeks. Looking at Greek thinkers from my particular approach meant taking their rebirth eschatologies seriously. Although classical scholars do recognize the importance of rebirth doctrines among the Presocratics such as Pythagoras and Empedocles, they rarely do for Plato. But to me Plato's thinking must be seen not in terms of a then-nonexistent European tradition but of existing thinkers in the then-known philosophic world, not just in the Greek world but the known contemporary world of which Greece was a part. In this work I am not primarily interested in the classicists' version of Plato as a philosopher or as a political and ethical thinker. I am concerned rather with Plato as a rebirth theorist and soteriologist who had a spiritual affinity with those of the Indian subcontinent, especially the Buddha. Those who have read the dialogues of the Buddha must surely be aware of their stylistic resemblance to Plato's dialogues, even though the Buddha was not interested in secular polity as Plato was. One does not have to posit actual contact between early Greece and India, although this was both possible and likely. Methodologically, however, given the mode of analysis employed in this book, one has only to recognize that Plato and the Buddha made sense in respect to their times and, given the power of their thought, affected human thought in general. Adopting this perspective I began to see Plato's rebirth eschatology as central to his cosmology and soteriology, not external or peripheral to it. The overwhelming majority of classical scholars, however, tend to treat Plato's rebirth theories as an allegorizing tendency or to simply ignore them. Yet it is interesting to note that Plato's disciple Plotinus treated his master's rebirth theories as literally true and imputes to Plato that same belief. Therefore I am in rather distinguished company in thinking that Plato himself probably believed in the truth of rebirth! However, I should not have been surprised that scholars have more or less ignored this aspect of Plato's thought because such myopia characterizes the work of ethnographers who have barely noticed rebirth eschatologies among the many groups they studied in the last century. So it is with Plotinus: most contemporary scholars who have written on Plotinus recently barely refer to his reincarnation theory, even though they agree that both Plotinus and his fellow Neoplatonists personally believed in it. Lloyd Gerson puts the matter somewhat equivocally: "I have argued that decline from a discarnate state has no meaning for Plotinus. This is not to say, however, that reincarnation is an essential part of his eschatology. Nevertheless, the evidence strongly suggests that Plotinus did in fact believe in reincarnation. "6 Commitments to such beliefs were so strong that Proclus (412-85 c.e. ), a famous Neoplatonic commentator, believed himself an incarnation of Nicomachus (c. 150 c.e. ), the author of a work entitled Theological Arithmetic.7 I find it hard to believe that such deeply held commitments were only peripherally relevant for understanding Neoplatonic mysticism and gnosis. Even more surprising is that the same lacuna exists in contemporary ethnographic accounts of Bali. I, as a native Buddhist, can go to Bali and find no difficulty whatever in carrying on a serious conversation about rebirth in English with educated Balinese, but little information on Balinese rebirth is available in the ethnographic literature by Western scholars. As I show in this book, this is because ethnographers are often not attuned to seeing and responding to views that are thoroughly alien to their own traditions. Indeed, Buddhists and Hindus find it difficult to converse on such matters with European intellectuals unfamiliar with the subcontinent. For example, for a human being to be reborn as a monkey or a bird or even as an insect or worm is something flagrantly outrageous or funny. Hence Walter Burkert could say that for the Greeks the doctrine of reincarnation is in essence "not theologia but anthropology, fantastic and yet recalling alleged experiences and predicting future ones. "8 He also tells us that reincarnation beliefs "remained a kind of foreign body in the framework of Greek religion. "9 These attitudes are but part of a larger theme that recurs in the classicists' version of Greek history and thought: a rarefied and reified distinction between a rational Milesian tradition, which represents the Greek civilization at its best, and a tradition of Western Greeks, who were influenced by a variety of "oriental" beliefs and also orgiastic rites associated with Orphic and Dionysian mysteries. Hence the cynical comment of Marcel Detienne: "the Greeks aren't like the others. "10 I have little sympathy for the orientalism that condemns oriental beliefs in this fashion, and I hope that this work will help to confirm that Greeks in some significant ways are very much like the others. Reincarnation beliefs not only enlink the Greeks in a larger chain of being but they were also not "fantastic" for those Greeks who believed in their reality. Hence, like Plotinus, I take seriously Plato's view that hardworking bourgeoisie could be reborn as industrious creatures such as ants and bees. Plato could be as ironic as the Buddha was about such matters, but irony did not exclude commitment to the truth of these beliefs. The fact that thinkers such as the Buddha and Plato allegorized some myths and deconstructed others did not mean that they did not believe in some and invent new ones, just as present-day deconstructionists do. In any case looking at Plato through the models constructed in this work might throw a different perspective on that great thinker's soteriology. If, with the Presocratics, I rely heavily on the interpretations of classical scholars writing in English, such is not the case with Plato. There was no way that I could master the voluminous research and commentaries on Plato's work. I therefore took the bold and perhaps foolish step of reading Plato in my own fashion, giving my own slant to his eschatological and soteriological vision. This orientation further implies that whether one is dealing with Platonic myths or Buddhist ones or those of small-scale societies, the analytical strategy should remain consistent. Even so, much of my presentation of Plato's thought might seem obvious to Greek scholars but not to my primary readership. Yet Greek scholars ought to recognize, I think, the importance of focusing on the neglected area of Greek rebirth seen within a larger cross-cultural context. The problem I have with Greek thought is true to a lesser degree with the other rebirth eschatologies I discuss in this work, with the exception of Theravada Buddhism. I can relate to Buddhism both from the inside, as someone socialized in it (albeit very imperfectly), and from the outside, as a scholar looking at texts, contexts, and practices. But what do I know of Amerindian or West African or Melanesian thought and texts? Once more I have to rely on the work of ethnographers who most certainly will disagree with some of my interpretations. Ethnographic prejudice virtually takes for granted that one cannot understand another culture unless one has done fieldwork in it. I do not buy this argument at all, but I am acutely aware of the shortcomings in my knowledge of these ethnographic areas. I ask ethnographers to withhold judgment until they have read the book in its totality because I hope that, in hermeneutical fashion, the exploration of one area will circle into another in a back-and-forth fashion. This book is not meant for someone primarily interested in area studies; it must be read as a totality to be properly appreciated. Breaking down areal barriers also meant breaking down barriers that separate scholarly disciplines and area studies from one another. These barriers, as we all well know, can be jealously guarded. Delimitation does not pertain exclusively to the theme of topographical models and structural change. As with Lévi-Strauss's work, structural models also tie in with much broader issues pertaining to the generation of knowledge, including soteriological knowledge. For example, my discussion of Indic and Greek rebirth focuses on thinkers or systems of thought given to understanding life and the world, existence and the universe, in terms of abstract concepts. I give the unsatisfactory label "conceptualism" (borrowed from European medieval philosophy) to designate this mode of thinking. I believe that Theravada Buddhism is ideally suited for this larger purpose, and it fits nicely with the broad stream of "Pythagoreanism" that I delimit, this being the tradition of thought that stems from Pythagoras and the Pythagoreans to Empedocles, Plato, and Plotinus—all driven by "conceptualism." Hence a further methodological justification for excluding those ecstatic and passionately devotional forms of religious life labeled "Orphism." They are not animated by conceptualism and hence are not necessary for the methodological operations ("imaginary experiments") I perform in this work. I now want to acquaint the reader very briefly with some stylistic devices I employ. I begin the book with the old problem of origins of Indic rebirth and karma doctrines. An early American Indologist, W.D. Whitney, says that the origin of rebirth is "one of the most difficult questions in the religious history of India," and this view is shared by many modern scholars.14 Yet there is an inherent difficulty in studying old texts such as Sanskrit and Greek texts (or for that matter ethnographic ones) that are fragmentary and sometimes downright inadequate for reconstituting lost eschatologies. To put it differently: the pre-Buddhist and Presocratic data do not permit reasonably accurate reconstructions of the past, only informed guesswork. Perhaps a structural argument might bring to bear on old texts a certain level of methodological and argumentative rigor. It should not surprise the reader that as my argument proceeds, the issue of origins drops out of the picture and the larger thesis of ethical transformation begins to emerge. I take the reader along with me to a developing argument, not a finished one. In general the technical terms I use will be clearly defined in the body of this work, with one proviso. Scholars often use the term transmigration as a synonym for reincarnation or metempsychosis. I use transmigration in a more limited sense, to designate an eschatology where the soul at death migrates to another form of sentient existence and stays there without seeking reincarnation. This usage will be made clear in my discussion of Igbo eschatology in chapter 2. Now to the vexing problem of translations and other technical matters. Translation is something virtually every ethnographer has had to face because ethnographies are never written in local languages, and it is rare that native texts enter into the body of an ethnography. We often have to read ethnographies on faith; there is no way that I could check whether Malinowski's Trobriand ethnography (or for that matter any of the ethnographies used in chapter 2 of this book) is based on an "adequate" knowledge of the local language. This ethnographic laxity will find few defenders among Indologists and classicists whose studies have been intensive and highly focused, based generally on the expert knowledge of one language and most often confined to a very limited historical period. I cannot claim that kind of expertise, and I have had to rely exclusively on translations. The translations I use for Theravada Buddhism are mostly from the Pali Text translation series, supplemented by some new translations of a few texts, particularly that of the DCgha Nik&ya (Long discourses) by Maurice Walshe.15 These translations are available in any major library. Since the first version of this book was written, I have seen one important new translation of the Majjhima Nik&ya (Middle length discourses) by Bhikkhu Ñ&Lamoli and Bhikkhu Bodhi; I have not been able to use this work as much as I would have liked to.16 I started with several translations of the Upanishads but soon substituted them with Patrick Olivelle's new translation, Upaniaads.17 For my initial understanding of the Presocratics my guide has been volumes 1 and 2 of W.K.C. Guthrie's magisterial work A History of Greek Philosophy.18 As far as the important fragments by Empedocles are concerned, I relied mainly on M.R. Wright, Empedocles: The Extant Fragments, supplemented by the new translation by Brad Inwood, The Poem of Empedocles.19 Whereas Wright adopts the older view that Empedocles wrote two poems, Inwood thinks he wrote a single poem and rearranges the fragments accordingly. Because I had written most of this book before I had read Inwood, I simply continued to use the traditional distinction. I do not think the debate over whether Empedocles wrote one poem or two matters very much for my argument. I also use both editions of The Presocratic Philosophers because although the second edition contains extensive changes, I found many useful ideas in the earlier edition.20 I am also aware that use of these works skews my discussion of Empedocles toward the older English tradition represented by John Burnet and those who followed him. I hope, however, that I have presented my arguments clearly enough to allow scholars to disagree with them. I have used extensively Thomas Taylor's classic nineteenth-century translations Iamblichus' "Life of Pythagoras" and Porphyry on Abstinence from Animal Food.21 I have supplemented Taylor's with Gillian Clark's translation and the more recent annotated translation by John Dillon and Jackson Hershbell.22 I simply used those translations I thought read best. For Plotinus I have used two major translations: the older one by Stephen MacKenna and the new standard edition and translation by A.H. Armstrong.23 Although Armstrong's is the more scholarly translation, MacKenna, I think, writes with feeling and perhaps touches the spirit of Plotinus's work. I had some difficulty regarding the transliteration of unfamiliar words in Sanskrit and Pali. For convenience I use the well-known Sanskrit forms such as karma and nirvana instead of the Pali kamma and nibb&La unless I am quoting from a text. I have, however, retained the Pali Dhamma instead of the more popular Sanskrit Dharma because the Pali word often has a more restricted meaning of "the Buddha's teaching" rather than the much more extended Sanskrit meaning of "the moral order." I have sometimes used simple renderings of Sanskrit words (for example, Upanishads) instead of a strict Sanskrit transliteration unless, once again, I am quoting some source. I have simply added the letter s to indicate the plural form of Indic terms. After the first instance I have not italicized technical terms and proper nouns that are commonly employed in this text, and some familiar terms such as nirvana are also used without diacriticals. So also with Amerindian and Greek terms, which I try to render rather simply than try for strict transliteration. In the process of writing this book I have incurred debts to many friends and colleagues who generously gave their time and advice. For the Greek material I owe much to the unstinting help of my colleague at Princeton Richard Martin, who urged me to push ahead with this line of exploration, and to Susan Lape, who helped me track down sources. Others read parts or the whole of the manuscript: William Cobb at the College of William and Mary; Anthony A. Long, whose sympathetic reading for the University of California Press forced me to rethink and rearrange the Presocratic material; Deborah Kamen, who rechecked the Greek material for factual and spelling errors; and my friend Merlin Peris, the Sri Lankan classical scholar, who was always there for advice. In Indological studies I have been blessed with good friends, kaly&na mitra: Patrick Olivelle, who helped me with the Vedic and Upanishadic material and corrected some horrendous mistakes, and Wendy Doniger, who read the original manuscript, prior to my Greek incursions. I must also record my appreciation for the help of H.L. Seneviratne, Henk Bodewitz, Joel Brereton, Deborah Cordonnier, and Sunil Goonesekera. As always I have learned much from Richard Gombrich, such that I do not always know when my ideas begin and his end! I only know that none of my friends and colleagues are responsible for some of the irrepressible thoughts expressed in this book. In my study of small-scale societies I have received similar unstinted support from Antonia Mills, who read the whole manuscript through, and in various ways from Michael Harkin, James Matlock, James Lorand Matory, Betsy Strick, Simon Ottenberg, Alma Gottleib, Sergei Kan, and Flora Edouwaye S. Kaplan. Although not all were directly interested in the themes of this book, I have derived much intellectual challenge and stimulation from friends and colleagues in the anthropology department at Princeton, most particularly from Hildred Geertz and John Mac Dougall, for their knowledge of Balinese rebirth, and Carol Zanca, our department manager, for her unfailing support. Special thanks to Mark Juergensmeyer, who urged me to submit this book for the series Comparative Studies in Religion and Society that he edits for the University of California Press; to Reed Malcolm, the acquisitions editor, for his enormous enthusiasm for the project; to his assistant, Cindy Wathen; to the unfailing courtesy of the staff of the Press, especially my manuscripts editor, Rachel Berchten; and to the indefatigable and conscientious copy editor Joe Abbott. This book would never have seen the light of day but for my wife, Ranjini, who continually encouraged me to finish a seemingly interminable project. Many of my ideas were initially presented in several seminars in Paris in June 1992 when I was directeur d'études at the Ecole des Hautes Etudes en Sciences Sociales. I thank the participants in those seminators for their insightful comments and to Eric Meyer, who made this visit possible. These initial ideas were further developed in the seminars I presented at the International Centre for Ethnic Studies in Colombo with which I was affiliated as a Fulbright scholar in 1993. I must place on record my affection for my many friends there, in particular Radhika Coomaraswamy, Sithy Thiruchelvam, Regi Siriwardene, and the many participants of those intellectual evenings, and for S. Varatharajan, who generously gave his time and help to a computer illiterate. It is with anguish and dismay that I record the tragic death in 1999 of my dear friend Neelan Thiruchelvam, the director of the Centre, as I was engaged in fieldwork in the Uva-Vellassa region of Sri Lanka. And it is with further dismay and sorrow that I record the sudden death of Destry Muller, a talented young photographer who took many pictures for me. He was killed on December 29, 2000, when the motorbike he was riding was hit by a bus on Sri Lanka's murerous roads. He was only twenty-one. Finally, a word of thanks for other institutions that supported this research at different times: the Fulbright Hays Fellowship, for providing me the opportunity to write the first draft during my 1993 sabbatical; the Rockefeller Center at Bellagio, for its inspirational setting; Princeton University, for faculty grants in times of want (which were many); and last, but not least, the International Institute for Asian Studies at Leiden and its director, Wim Stokhof, and his colleagues. I cannot think of a better place than the beautiful city of Leiden for putting together a satisfactory first version of a work that to me remains an unfinished one. 1.Gananath Obeyesekere, "Theodicy, Sin, and Salvation in a Sociology of Buddhism," in Dialectic in Practical Religion, ed. Edmund R. Leach (Cambridge: Cambridge University Press, 1968), 7-49. 2.Gananath Obeyesekere, "The Rebirth Eschatology and Its Transformations: A Contribution to the Sociology of Early Buddhism," in Karma and Rebirth in Classical Indian Traditions, ed. Wendy Doniger O Flaherty (Berkeley: University of California Press, 1980), 137-64. 3.Gananath Obeyesekere, "Reincarnation Eschatologies and the Comparative Study of Religions," foreword to Amerindian Rebirth: Reincarnation Belief among North American Indians and Inuit, ed. Antonia Mills and Richard Slobodin (Toronto: University of Toronto Press, 1994), xi-xxiv. 4.Herbert Strainge Long, A Study of the Doctrine of Metempsychosis in Greece from Pythagoras to Plato (Baltimore: J.H. Furst, 1948); Merlin Peris, "Greek Teachings of Reincarnation from Orpheus to Plato" (Ph.D. diss., University of London, Queen Mary College, 1963). It is a pity that Peris's comprehensive 759-page study has not yet been published. I found myself overwhelmed by the mass of data painstakingly garnered by Peris, and for the most part I have referred to his important work in endnotes. 5.Peter Kingsley, Ancient Philosophy and Magic: Empedocles and the Pythagorean Tradition (Oxford: Clarendon Press, 1995). Unfortunately, this imaginative study is devoid of theoretical understanding and is full of ad hoc interpretations. Not one modern thinker is mentioned in the bibliography, except Jung, who is cited for his work on alchemy. 6.Lloyd P. Gerson, Plotinus (London: Routledge, 1998), 209. 7.R.T. Wallis, Neoplatonism, 2d ed. (London: Gerald Duckworth, 1995), 32. 8.Walter Burkert, Ancient Mystery Cults (Cambridge: Harvard University Press, 1987), 87. 9.Walter Burkert, Greek Religion (Oxford: Blackwell, 1996), 298. 10.See chap. 1 in Marcel Detienne, Dionysus Slain (Baltimore: Johns Hopkins University Press, 1979). 11.Larry J. Alderink, Creation and Salvation in Ancient Orphism (Chico, Calif.: Scholars Press, 1981), 56. 12.See Robert Parker, "Early Orphism," in The Greek World, ed. A. Powell (London: Routledge, 1995), 483-510. 13.M.L. West, The Orphic Poems (Oxford: Clarendon Press, 1983). 14.W.D. Whitney, Oriental and Linguistic Studies (New York: Scribner, Armstrong, and Lo, 1873), 61; for details see the important paper by H.W. Bodewitz, "The Hindu Doctrine of Transmigration: Its Origin and Background," in Bongard-Levin Felicitation Volume, forthcoming. 15.Maurice Walshe, The Long Discourses of the Buddha (Boston: Wisdom,1995). 16.Bhikkhu Ñ&Lamoli and Bhikkhu Bodhi, trans. and ed., The Middle Length Discourses of the Buddha (Boston: Wisdom, 1995). 17.Patrick Olivelle, Upaniaads (New York: Oxford, 1996). 18.W.K.C. Guthrie, The Earlier Presocratics and the Pythagoreans, vol. 1 of A History of Greek Philosophy (1971; reprint, Cambridge: Cambridge University Press, 1992); W.K.C. Guthrie, The Presocratic Tradition from Parmenides to Democritus, vol. 2 of A History of Greek Philosophy (1971; reprint, Cambridge: Cambridge University Press, 1995). 19.M.R. Wright, Empedocles: The Extant Fragments (London: Bristol Classical Press, 1995); Brad Inwood, trans., The Poem of Empedocles (Toronto: University of Toronto Press, 1992). 20.G.S. Kirk and J.E. Raven, eds., The Presocratic Philosophers (Cambridge: Cambridge University Press, 1957); G.S. Kirk, J.E. Raven, and M. Schofield, eds., The Presocratic Philosophers, 2d ed. (Cambridge: Cambridge University Press, 1983). 21.Thomas Taylor, trans., Iamblichus' "Life of Pythagoras" (Rochester, Vt.: Inner Traditions International, 1986); Thomas Taylor, trans., Porphyry on Abstinence from Animal Food (London: Centaur Press, 1965). 22.Gillian Clark, trans., Iamblichus: On the Pythagorean Life (Cambridge: Liverpool University Press, 1982); John Dillon and Jackson Hershbell, trans., Iamblichus: On the Pythagorean Way of Life (Atlanta, Ga.: Scholars Press, 1991). 23.Mackenna, Stephen, trans., Plotinus: The Enneads, abr. ed. (London: Penguin Classics, 1991); A.H. Armstrong, trans. and ed., Plotinus, 7 vols. (Cambridge: Harvard University Press, 1966-88). Obeyesekere's comprehensive inquiry shows that diverse societies have come through independent invention or borrowing to believe in reincarnation as an integral part of their larger cosmological systems. The author brings together into a coherent methodological framework the thought of such diverse thinkers as Weber, Wittgenstein, and Nietzsche. In a contemporary intellectual context that celebrates difference and cultural relativism, this book makes a case for disciplined comparison, a humane view of human nature, and a theoretical understanding of "family resemblances" and differences across great cultural divides. Gananath Obeyesekere is Professor of Anthropology, Emeritus, at Princeton University. He is the author of The Apotheosis of Captain Cook: European Mythmaking in the Pacific (1997), The Cult of the Goddess Pattini (1984), Medusa's Hair: An Essay on Personal Symbols and Religious Experience (1984), and The Work of Culture: Symbolic Transformation in Psychoanalysis and Anthropology (1990).